Friendly, spacious and contemporary but historic like grandmother’s house.Three plus bedrooms, 2 baths, sleeps 6-8. 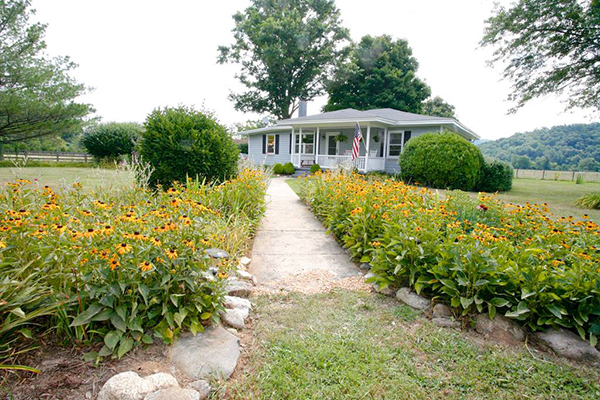 The guest house is within a few miles of 6 Nelson County wineries, 3 breweries, 1 cidery, restaurants and shops. The Blue Ridge Parkway, Crabtree Falls, George Washington National Forest, and Appalachian Trail are at the back door. Wintergreen Resort with golf, tennis and winter skiing are only minutes way. Spectacular panoramic mountain views. Located on an active farm that includes Black Angus cows, renowned Lilly the donkey, two miniature Sicilian donkeys, Caromont goats, Scottish Blackface sheep and chickens in season.